On August 8, 1900, at the second International Congress of Mathematicians in Paris, David Hilbert delivered the famous lecture in which he described twenty-three problems that were to play an influential role in future mathematical research. A century later, on May 24, 2000, at a meeting at the Collège de France, the Clay Mathematics Institute announced the creation of a US$7 million prize fund for the solution of seven important classic problems that have resisted solution. The prize fund is divided equally among the seven problems. There is no time limit for their solution. 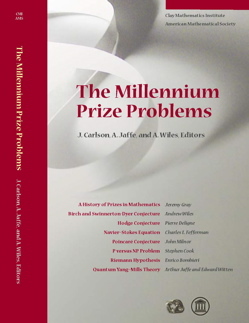 The Millennium Prize Problems were selected by the founding Scientific Advisory Board of CMI, Alain Connes, Arthur Jaffe, Andrew Wiles, and Edward Witten, after consultation with other leading mathematicians. Their aim was somewhat different than that of Hilbert: not to define new challenges, but to record some of the most difficult issues with which mathematicians were struggling at the turn of the second millennium; to recognize achievement in mathematics of historical dimension; to elevate in the consciousness of the general public the fact that in mathematics the frontier is still open and abounds in important unsolved problems; and to emphasize the importance of working toward a solution of the deepest, most difficult problems. The Millennium Prize Problems gives the official description of each of the seven problems and the rules governing the prizes. It also contains an essay by Jeremy Gray on the history of prize problems in mathematics.